When meeting a fellow student at Northwest University, a common question you will ask, preceded by majors and home towns, is what floor he or she lives on. Unless you have friends coming with you to NU, your floor mates are going to be the first students you meet and, hopefully, the first friends you make. These neighbors may become your foundational community at NU: your walking buddies, occasional book lenders, and Caf companions. This dynamic is important to new students and gives them the opportunity to experience a unique sense of community, as the residents of the oldest floor on campus can attest. 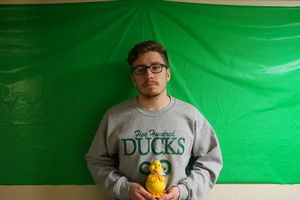 The Ducks of Grey 500 have been a community for approximately 30 years, longer than any other floor. Their specific traditions and rituals are exclusive to the floor, and the bonding effect these have on the Ducks is evident. Jesse Dinius, current RA of Grey 500, said these traditions are an important factor in fostering familiarity between residents. “Our traditions have built such a strong floor community that people have grown to love them, and because of that the floor theme has stayed…we still have connections to guys who lived here in the ‘70s,” Dinius said. Such a connection is proudly displayed on one wall of Grey 500’s lounge, dubbed “The Pond.” A shirt that reads “Northwest University Grandparent,” which belonged to a Duck alumni, hangs on the wall. The elder Duck gifted the shirt to Dinius after discovering that he currently lived on the floor. The nametags on everybody’s doors read “Grey 500 Ducks: 2015-Infinity” and appear to be accurate as former residents of the Ducks floor still spend time in The Pond alongside current tenants. The inhabitants of Grey 500 refer to Dinius as Papa Duck, and he fits this role well. Though often joking around cordially with his residents, when necessary, he can be authoritative. There is a strict “no pranking” rule for the Ducks and when that rule is breached, Dinius handles it sternly. Though mindful of his responsibility as floor administrator, Dinius would like to be remembered as an RA who was sincere. “I would like to be known as an RA who truly cared, who valued the brotherhood on the floor and did what I could to help build it and maintain it. Most importantly, I would like to be remembered as an RA who had a genuine impact for the better on the lives of my guys and on the campus.” Though Dinius graduates next semester, the Ducks will carry on into infinity.